Tattletale is one of those books that I keep hearing about, so I had great expectations when I began to read. I was not disappointed. Mary Magdalene (Mags) is on a flight from the States to the UK when she meets Daniel. At another time in her life he would be exactly what she needs, but her reason for travelling to the UK is not a happy one. Mags' brother Abraham (Abe) is in a coma having fallen several flights of stairs and she is listed as his next of kin and emergency contact despite not having seen him in years. The local police believe that Abe was depressed and suicidal. Not so says his fiancée Jody, who believes he was pushed. At first Mags is indifferent, she barely knows her brother anymore, he is a stranger to her. Why should she get to decide if he lives or dies? Then she becomes suspicious, although some pretty bad things happened to them during their childhood, she cannot believe that Abe was depressed. As she moves into his flat ad converses with his neighbours, she learns that Abe has grown into a kind, sweet and gentle man. But if that is so, then who would want him dead? Was it ‘just’ an accident, or is there something more sinister at play? Jody is Mags' first suspect, as she begins to act suspiciously around her. Jody’s former social worker assures Mags that Jody is quite harmless and she wouldn’t hurt anyone, but Mags barely knows the girl, and doesn’t know what to believe. As Mags begins to uncover her Brother’s private life piece by piece, it seems like everything she knew about him is bought into question. Did she really know Abe at all? Tattletale is a very clever book with multiple layers. Just when you think you know its characters inside out you may find yourself surprised. I know it's still early, but this is sure to be one of 2017's best sellers. 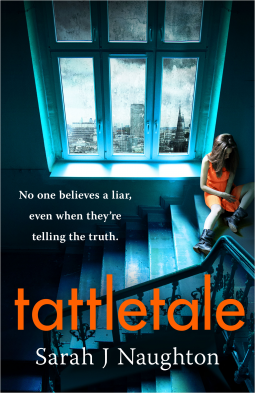 Tattletale is available from 26 January.